Walt Disney World has over twenty themed properties ranging from Value (which really are great value) to Moderate, to Deluxe, to suites at Vacation Club resorts (which can be booked by any guest), plus the unique Fort Wilderness Resort and Campground. Guests at any of these places get all the perks of staying at a Disney resort. These properties are grouped by locations. Five excellent resorts are located near the Magic Kingdom theme park, and three of them -- the Grand Floridian, the Polynesian, and the Contemporary -- are connected to the theme park and to each other by a monorail. The monorail also extends to Epcot. Convenient! Disney's Grand Floridian Resort and Spa is a Deluxe flagship property in the style of classic Victorian beach resorts, with a showpiece lobby, spa, and concierge category rooms and suites. 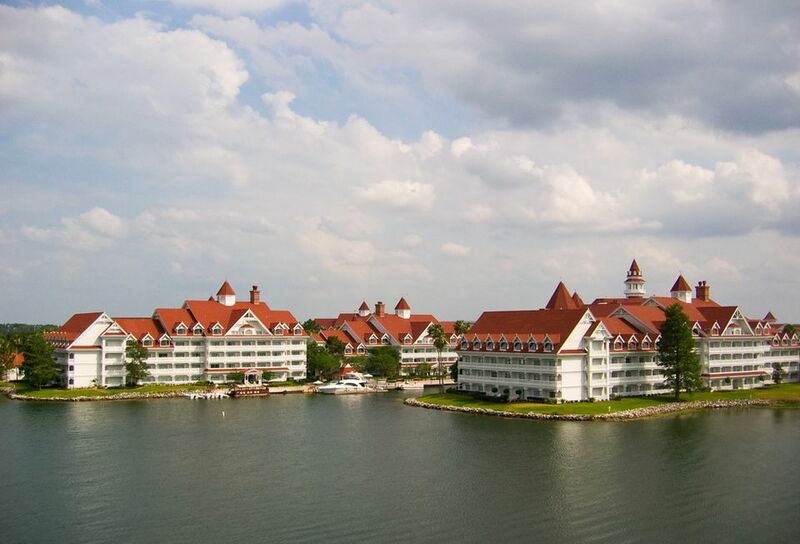 The Grand Floridian has a beach, marina, boat rentals; evening kids club; character meals; many kids' activities. Location: A prime spot on the Seven Seas Lagoon, across from the Magic Kingdom; boat or monorail to MK; view of nightly fireworks. Monorail provides quick access to Epcot theme park, too. South Pacific theme; with beaches, tropical landscaping, waterfalls, and a torch-lighting ceremony. Features include a volcano pool; evening kids club; Character Breakfast; luau dinner show; marina, sailboats; views of fireworks. Concierge service. Location: On the Seven Seas Lagoon, across from Magic Kingdom; take a boat or monorail to MK; views of nightly fireworks. Monorail provides quick access to Epcot theme park also. Another Deluxe choice, with large rooms and suites and a concierge level. Features include boat rentals at a marina; water skiing, tubing, wake-boarding; beach area (no swimming, though); large freeform pool with slide; views of fireworks and Electrical Water Pageant. Location: On the Seven Seas Lagoon, with access by boat or monorail to Magic Kingdom, and to the Grand Floridian and Disney's Polynesian Resort. Bay Lake is on the other side of the Contemporary. The monorail takes guests to Epcot too. Inspired by the wonderful Old Faithful Inn in Yellowstone National Park, this Deluxe property has a rustic exterior, 82-foot high fireplace, and a geyser that sprays 120 feet high. Features include a spa, health club, concierge services, junior suites; evening kids club; sandy beach, boat rentals; bike rentals, horse-drawn carriages; pool with waterfall and slide. Location: On Bay Lake; guests can take a boat to MK, or to Fort Wilderness Resort and Campground for dinner shows and recreation. Sharing this location are the Villas at Wilderness Lodge, part of the Disney Vacation Club but rooms can be booked by any guests. The only place to camp "in the World"; or rent a cabin that sleeps six and has a kitchen. Fort Wilderness has huge grounds with lots of recreation, dinner shows, free campfire and evening outdoor movies. Two pools; canoes, kayaks, paddleboats, wagon rides, pony rides, horseback rides. A very fun resort! Pet-friendly, too. Location: On Bay Lake; guests can take a boat to Magic Kingdom. This Deluxe property has amazing African architecture and decor; six-story lobby; best of all is the savannas where African animals roam. Spa fitness center, concierge floors, fine dining; large zero-entry pool with slide; kids pool; kids activities and evening kids club. The location is very near the Animal Kingdom theme park. Sharing this location are the Animal Kingdom Villas, part of the Disney Vacation Club, but can be booked by any guests. In the Moderate price category, this is a large and beautiful resort with a 15-acre man-made lake, nature walk, Mayan-themed pool with Jaguar water-slide, children's pool, playground and a health club. Theming is American Southwest/Northern Mexico. A marina is open seasonally on Lago Dorado and rents kayaks, pedal boats, and other boats; bikes and surrey-bikes are for rent as well. Location: Classified as "Near Animal Kingdom", but driving time is shorter (about 10 minutes) to Epcot, and to Disney's Hollywood Studios (less than 10 minutes); Animal Kingdom and Magic Kingdom are an estimated 20 minutes away. A Value choice with colorful and fun theming, and all the perks of staying at a Disney World resort. Food courts; two swimming pools. Location: In the Animal Kingdom area, and also close to Disney's Hollywood Studios theme park and Blizzard Beach Water Park. The theme is 1930s Eastern Seaboard; the lakeside boardwalk has restaurants, shops, and nightspots. This Deluxe resort has evening kids' club, Concierge Service, health club, spa. Activities include bike-rides on the boardwalk, Surrey bikes, tennis, games, seasonal fun such as jugglers, magic shows, midway games. Luna Park carnival-themed pool area has a 200' water slide. Location: A top spot! 5-minute walk to Epcot, through the International Gateway; after the nightly IllumiNations Show and fireworks, stroll back to the boardwalk scene lit up beside Crescent Lake. Disney's Hollywood Studios is a 20-minute walk away, or take a boat to DHS or Epcot. The Beach Club and adjacent Yacht Club -- both Deluxe -- have suites and concierge level, and share Stormalong Pool, over 3 acres in size, with several different areas, sandy wading area, waterslide. (Access is limited to BC and YC guests.) Activities might include campfire sing-a-long or Movie Under the Stars. Bayside Marina has cruise excursions. IllumiNations cruises are pricey but popular; guests can also see Epcot's IllumiNations fireworks from the beach. Location: Same prime location as BoardWalk Inn, above. All three are on Crescent Lake; the boardwalk's a great place to stroll, day or night. Five minutes walk to Epcot and close to Disney's Hollywood Studios. take a boat, or even walk if you like. Part of the Disney Vacation Club, though guest rooms can be booked by any guest; units range from studios to three bedrooms, and have the convenience of kitchens and washer/dryers. Location: Same prime location as the Beach Club property. Location: ​This resort is classified in the Downtown Disney area, but is close to Epcot theme park. Adjacent to Disney's Port Orleans - French Quarter. Take a boat to Downtown Disney. Location: Classified as in the Downtown Disney area, but close to Epcot theme park. Take a boat to Downtown Disney. The fourth "Value" resort, themed around pop culture from every decade of the twentieth century, with lots of fun memorabilia and images of pop culture icons. Location: This resort is said to be in "Disney's Wide World of Sports" area, and is not really near any theme park. Bus time to Disney's Hollywood Studios or Animal Kingdom is estimated as 15 minutes; Epcot and Magic Kingdom are farther. Relatively near to Disney's Caribbean Beach. A Moderate property; colorful low-rise units around 42-acre lake; beach, and boat rentals; Parrot Caye Island with playground; and a fun pool with castle and pirate themes, and waterslide. Location: This resort is said to be in the "Epcot Area", but its location is around the back of the Epcot theme park (and it's also to the back of Disney's Hollywood Studios.) Therefore the bus ride to Epcot is estimated as 12 minutes; 15 minutes, to Disney's Hollywood Studios. Magic Kingdom and Animal Kingdom are further. Nearest other resort is Disney's Pop Century. The theme is upstate New York in the late 1800's: the heyday of horse-racing and country retreats, and "taking the cure" at natural springs. Location: Near Downtown Disney. A short walk to Cirque de Soleil and other entertainment venues, restaurants, shops. This Disney Vacation Club resort has a Florida Keys theme. Units can be booked by any guests, not just Vacation Club members, and range from studios to three-bedroom guestrooms, with the convenience of kitchens and washer/dryers. Location: Near Downtown Disney; take a boat to restaurants, shops, and entertainment zone. This timeshare program works on a flexible "vacation point" system; guests can choose from Disney Vacation Club Resorts (at Disney World, and other locations such as Disney's Vero Beach Resort); other select resorts at Disney World, Disneyland California, Disneyland Paris; Disney Cruise Line vacations; Adventures by Disney; or from other "Member Getaways" worldwide. Nice for families: the Vacation Club Resorts at Disney World have suites with kitchens, laundry, and multiple bedrooms.